Save the Bees; Respect Life is a small (1/4 sheet watercolor paper) watercolor painting and ink drawing. This little piece was juried into NAWA’s exhibition “Art of the Story,” New York. 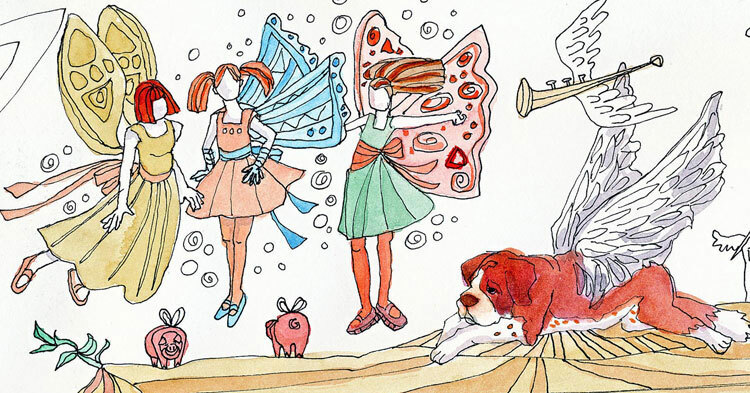 detail of Things with Wings (watercolor); the St. Bernard is our dog Minnie who passed away several months ago. It was weird that I had painted her with wings just a few months before she died.